JetBlue announced it has begun selling food onboard its aircraft after over a year of testing the idea. The airline debuted five snack box options, all of which will sell for $6. The for-purchase boxes are only available on flights three hours and 45 minutes or longer, and the airline will continue offering its lineup of free snacks on all flights. The snack packs include a breakfast option, which is comprised of a croissant, strawberry jam, almond butter, Cheez-its, a fruit cup, and chocolate milk; and four lunch/dinner options that range from a meat-and-cheese assortment to a healthy arrangement of hummus, nuts, and raisins. I use the terms “breakfast,” “lunch,” and “dinner” loosely because these are not meals by any stretch. The snack packs are exactly that: a bunch of snacks put together to form a reasonably filling light meal. JetBlue takes pains to point out the brand name of each item, and indeed there are some respectable labels, but this is just window dressing. What you’re getting is a bunch of snacks. Sustenance? Sure. Dinner? Not really. Which would be fine, but JetBlue already has snacks—snacks that are tasty, unlimited and, most importantly, complimentary. So why bother selling something already offered for free? Well, JetBlue isn’t bothering on its short-haul flights, opting instead to sell food only on long-haul routes. This makes sense, as passengers on lengthy flights may prefer a pre-arranged boxed option rather than a cobbled-together mish-mash of cookies and whatnot. If I sound unimpressed, it’s because I am. I would have liked to see reasonably priced, high-quality sandwiches and salads instead of more chips and cheese. The snack boxes just seem to lack creativity, especially from an airline that prides itself on being ahead of the curve when it comes to customer service. Then again, JetBlue has over a year of testing under its belt, and must have received customer feedback that pushed it in this direction. But as a JetBlue fan, I can tell you I’ll be sticking with the free options and will continue bringing my own food aboard for longer flights. 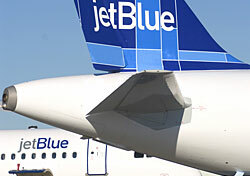 Readers, what do you think about JetBlue’s new food for purchase?